Oil was down 8.5% through the close of trading Wednesday. Of course, that's after the 10.3% rise for the week through Sept. 8, showing how "range-bound" oil prices are right now. But signs are now pointing to us breaking free of this "range." You see, wherever oil's price floor moves, the overall price soon follows. And even as volatility persists, that floor has been rising. It's now at about $44 a barrel, while the ceiling is $48. And both are moving up. Of course, the "30-second pundits" on TV would have you believe otherwise. They've returned to their "oversupply" mantra, talking about nothing but oversupply in the market and the return of global volume from conflict locations like Nigeria and Libya. The excess supply in storage continues to be more than manageable. In fact, it is now well below concern levels in each of the three primary U.S. storage categories: refineries (65%), bulk terminals (54%), and tank farms (66%). Pressure has also been easing at Cushing, Okla. Cushing is the largest confluence of oil pipelines in the country, and the location where the daily WTI price is set. There, new pipe networks are able to draw volume away to the petrochemical complex on the Gulf Coast. While these predicted exports have begun showing up in futures contracts, there is currently no "wet" barrel volume to support them. Traders are factoring in these exports at a discount to improve margins. Wednesday, Sept. 14, Savita Subramanian – the head of equity and quant strategy at Bank of America Merrill Lynch (BAML) – released a report arguing that oil prices were about to surge. BAML has upgraded the sector to "Overweight" from "Market Weight," with the expectation that it will outperform the S&P 500. 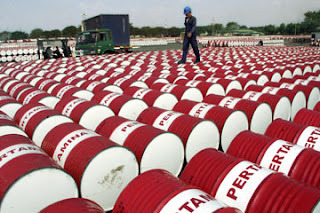 "Our commodity strategists estimate that most of the sell-off in oil prices is behind us, as they look for WTI oil prices to rally to $54/bbl (+17%) by the end of the year and $69/bbl (+49%) by next June," Subramanian wrote to clients. "Oil production continues to fall, as global oil and gas investment has been cut by nearly $300bn (41%) and rig counts have dropped by 37% since the 2014 peak. In contrast, low oil prices continue to drive healthy demand growth, putting the oil market on pace to see its biggest supply-demand deficit since 2011." More importantly, several analysts have this week pointed out that current excess oil production is now largely fueled by OPEC overproduction. That's the main reason that balance has yet to appear. I expect that OPEC will lay the groundwork for a deal to phase out that overproduction during the International Energy Forum in Algiers, to be held on Sept. 26-28.